Fun fact: the word vinegar originates from the French term “vin aigre”, which translates to “sour wine,” most likely because a long time ago someone in France got really disappointed one day when they discovered that their supply of wine had gone bad. These days, apple cider vinegar (ACV) has become quite popular, but you don’t need to be a modern hippie or an aspiring zero-waster to love all its powers! ACV is your one-stop-shop natural solution for cleaning, improving digestion, improving skin tone, managing wounds, and so much more. The best part of it is that you can make it at home from the scraps of fruit you would probably throw out anyway! So next time you bake a delicious apple pie, keep the peels and cores aside for making your own tasty and healthy batch of all-purpose liquid gold. But what is apple cider vinegar, really? Vinegar is the result of a two stage fermentation process. In the first stage, yeast that’s present in the air and on fruit feeds off of sugars, releasing alcohol as a byproduct. While in the second stage, this alcohol is oxidized to acetic acid (vinegar) by bacteria. This whole complex process results in a liquid that is rich in minerals like potassium and magnesium, many vitamins, probiotics, and beneficial enzymes. In addition, the acetic acid has the ability to kill bacteria that is harmful for humans while supporting and nourishing the ‘good’ bacteria that protects us, which is why it’s so good for our gut health, skin, and immunity without causing any harmful side effects. As mentioned above, ACV has the ability to keep harmful bacteria at bay, while protecting the kind that our skin needs to remain healthy. This means that when applied to the face, ACV helps keep skin clean and free of pimples. Our skin is also slightly acidic just like ACV, making it the perfect astringent to balance pH. This ensures that our skin does not become too dry or too greasy due to sebum overproduction (that being said, I wrote an article all about the benefits of sebum here). Use it: to make a basic toner, make a solution of 1 part ACV and 2 parts water and dab on face just like you would any other toner. Your hair and scalp are also slightly acidic. For hair, the acidity in ACV helps smooth out the shafts of each hair strand to make it shinier, stronger, and less tangled. Your scalp will also benefit due to ACV’s astringent properties (yes, your scalp loves astringents just like the rest of your skin) and antifungal characteristics that protect us from dandruff. Use it: to make a hair and scalp rinse, put 2 teaspoons of ACV in one cup of water, then pour over hair after (or in place of) conditioner. Rinsing it out afterwards is optional, but I do. If your hair feels too dry afterwards, consider adding another teaspoon of ACV, and if it seems too greasy, cut back to 1 teaspoon next time. Besides all the vitamins, minerals, and enzymes, ACV also contains polyphenols, which are a compound that contribute to antioxidant and anti-inflammatory processes that protect your heart, blood vessels, and bones. Rich in probiotics and acetic acid, ACV stimulates gut motility and assists in restoring helpful bacteria to protect your immunity and intestines. 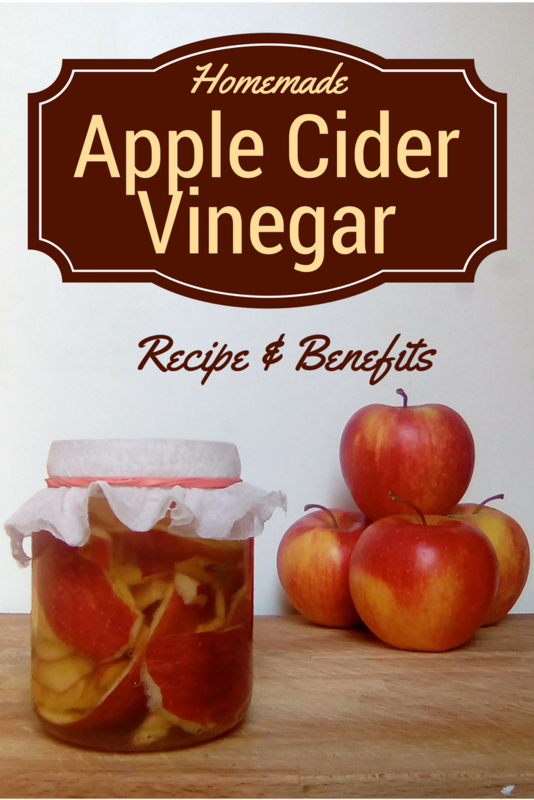 Even though ACV is acidic, it is also helpful in reducing heartburn (acid reflux) symptoms thanks to its effects on pH and digestion stimulation. Many people struggle with yeast infections (candida), thrush, and general fungal infections. The ACV has probiotics and probiotic stimulating properties that help your body naturally fight these fungal infections. For athlete’s foot and toenail infections, ACV is also very effective. for unsightly athlete’s foot or toenail infections, you can make a foot soak of 1 part ACV to 2 parts warm water. Let your feet soak about 15-20 minutes every day. There’s a lot of scientific research supporting that the acetic acid in ACV improves insulin sensitivity and response rates, making it an ideal supplement for those who have, or are at risk for diabetes. Use it: drink a teaspoon of ACV in a cup of water first thing each morning. Because ACV has antimicrobial and antifungal properties, it is great for making sure your household objects and surfaces remain free of harmful bacteria. Use it: Make a solution in a spray bottle of 50% water and 50% ACV, and use it just like you would any commercial disinfectant. 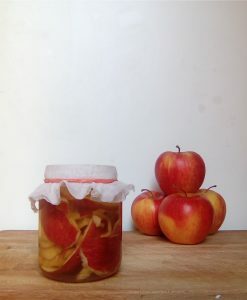 Choose a wide mouthed glass jar and fill it with apple scraps about ¾ of the way up. In a separate container mix sugar and water, then pour enough of it into your jar to cover all the apple pieces. 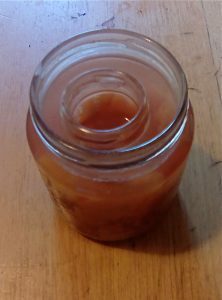 Try to keep the fruit pieces below water level to prevent them from molding; if you have a hard time keeping them submerged, you can place a weight on them, like another smaller empty glass jar that fits in your jar (like I did in the image here) or a fermenting glass weight. Cover the jar with a light towel, cheesecloth, or coffee filter and secure it with a rubber band. The idea is that air should be able to pass, but gnats and impurities should stay out. Place the jar in a warm, dark place for about 2 weeks. You’ll notice this time is up more or less when the apple pieces start sinking to the bottom. 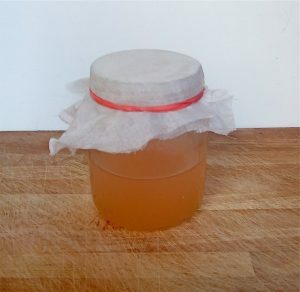 Strain the jar’s contents through a few layers of cheesecloth or coffee filter, discard the the apples, and return the liquid to the original jar for another 2-4 weeks. Occasionally stir the liquid every few days. After that time period has passed, start tasting it every once in a while (or if you just can’t bring yourself to do it, smell it). Once it has reached your preferred vinegar taste (or smell), put a lid on it and store either in a cool place or even in the fridge. Make sure your jar and utensils (including your hands) are very clean. Sterilizing would of course be awesome, but unless you live in a disinfected bubble, sterilizing attempts are useless. Any variety of apple will be fine, in fact you can also use other fruit like pears, peaches, and tomatoes instead. Organic is obviously best, but any well-cleaned fruit is fine. Fermentation and timing is a little of an art form, so there really is no strict instruction for how long to let it sit in the various stages. But, be mindful that smaller pieces that have more surface area, like peels, will ferment faster than larger (diced) slices, and fermentation will be faster in warmer climates than in cooler climates. You will notice a bubbly film form on the surface within the first few days. This is good and shows fermentation is taking place; there’s no need to worry or remove it. If you see any blue, fuzzy, or otherwise colored patches, those are most likely mold, but you do not have to throw out the whole batch; just skim it off with a clean utensil. I’ve read that you should not use metal utensils at all when making ACV, but I haven’t found any supporting evidence that the occasional dipping of, for example, a metal stirring spoon or strainer will cause leaching of chemicals. My advice is to always use glass as your fermentation container, but don’t worry too much about the utensils. Waiting those 2 weeks for straining the apple scraps is once again a general suggestion. Some people leave the scraps in the whole time, so don’t worry if you forgot about your jar for over 2 weeks. If it looks healthy, then it’s still doing its magic. Keeping apple pieces submerged is a suggestion to make it even less likely that they may mold, but it is not necessary. If you still struggle with stubborn floating pieces, just try to keep everything as clean as possible and peek at it on occasion to make sure everything is going well. It will remain cloudy, unlike store bought varieties, because your homemade brew is unfiltered and unpasteurized. It may also have brownish sediment or stringy-looking things in it, which are all signs of healthy and nutrient-rich ACV. And, if you are lucky enough to have that gelatinous film form on top, well, then consider yourself lucky because a SCOBY or “mother” has decided to find a happy home there. I like to let mine hang out wherever she has formed, but you can also transfer it to newer batches of vinegar to help tem ferment faster, or even use it as a kombucha starter. This all may sound a bit intimidating and technical, but it’s actually quite simple. The fun part of it is that no two batches are the same. The last one I made for picture purposes of this post, for example, turned out to be this beautiful pink lemonade color and it tastes wonderful!